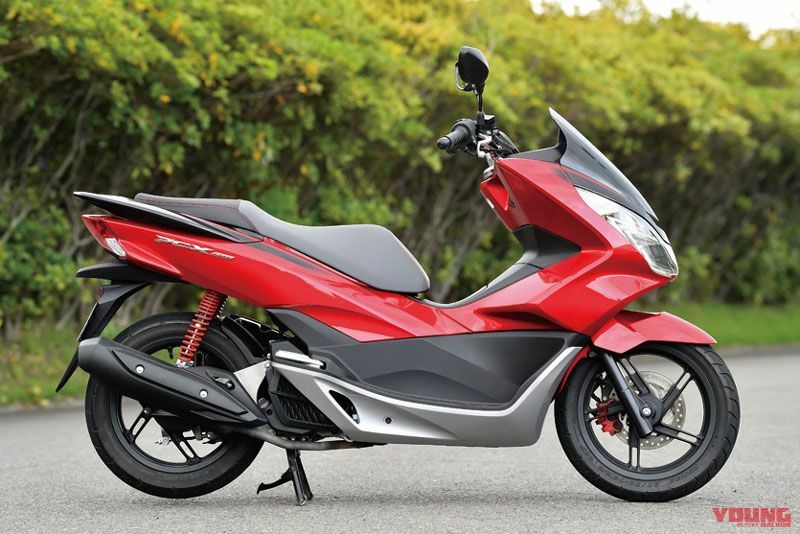 The PCX series has continued to make a steady advance ever since it appeared in 2010, with its premium feel and easy-to-manage size that offers great rideability for anything from commuting to touring. There is a lightweight 125cc and 150cc in the series, and both models got a full model change in April of this year. 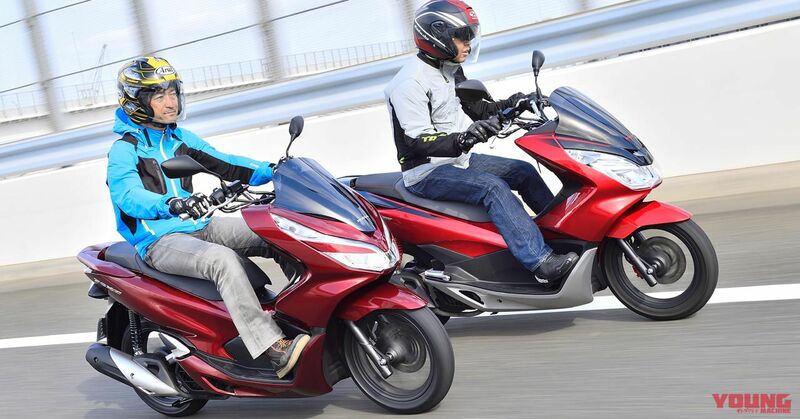 The PCX150 is the best-selling lightweight scooter, and many of its rivals are in hot pursuit. First of all, let’s check out the level of progress from the old to the new in easy-to-understand terms. 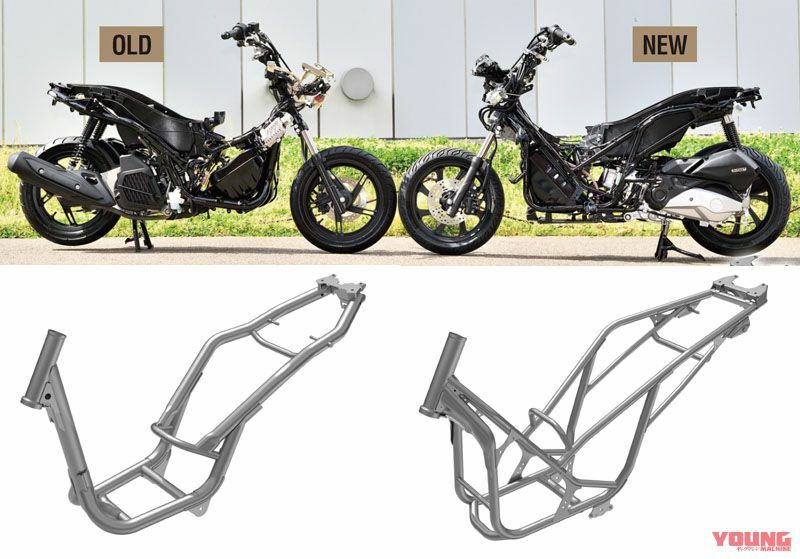 A simple look at the model changes shows how the old under-bone structure frame changes to a double-cradle frame. Also, while the front and rear tyres remain unchanged at 14 inches, the front is widened one size, and rear widened by two. The water-cooled one-cylinder eSP 149cc engine complies with the 2016 exhaust emission regulations, while the intake and exhaust system, power train and cooling systems are revised. Peak power output has been raised by 1bhp, bringing it to 15bhp. Another point worth noting is the ABS type front brakes which are a first in the series, of which we used on our test. 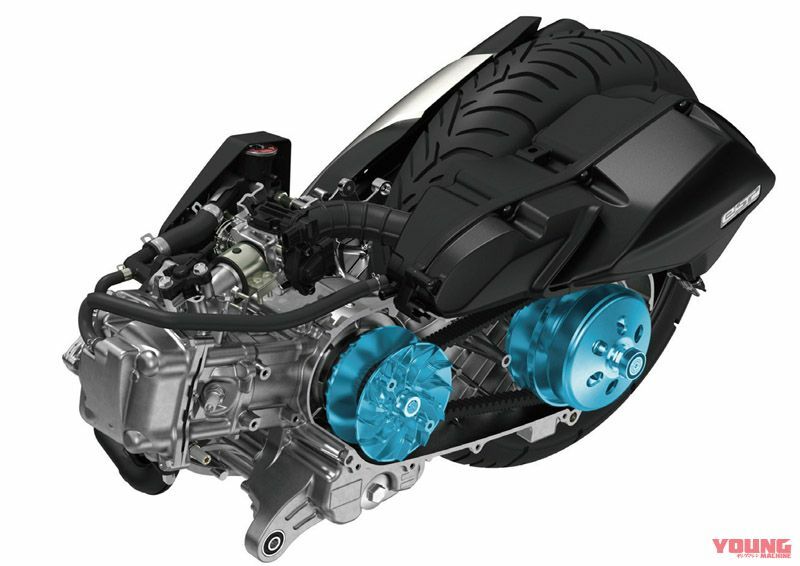 In addition, the standard spec model without ABS has brakes that operate together front and rear. 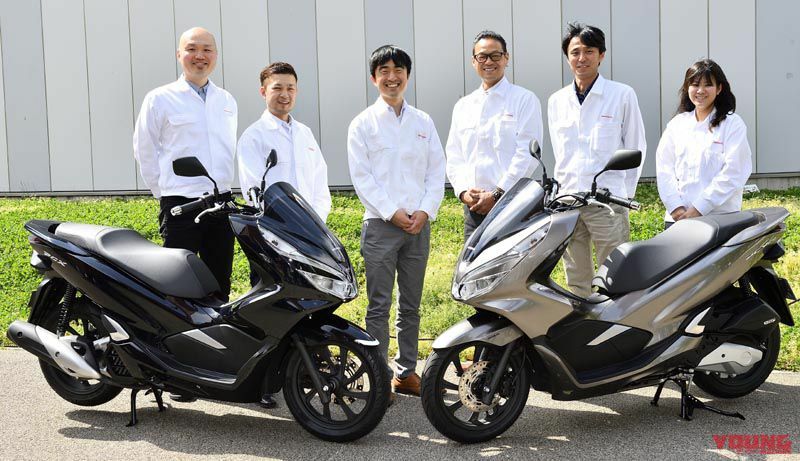 (2018 Honda PCX150 / ABS. Japan spec. Price: equivalent to $3385 / $3550) This new model was released for sale on 20th April 2018. The frame gets a complete change, and the eSP engine has been improved. The bike we had on test was the ABS spec version, the first in the series to come equipped with ABS. (2017 Honda PCX150. Japan spec. 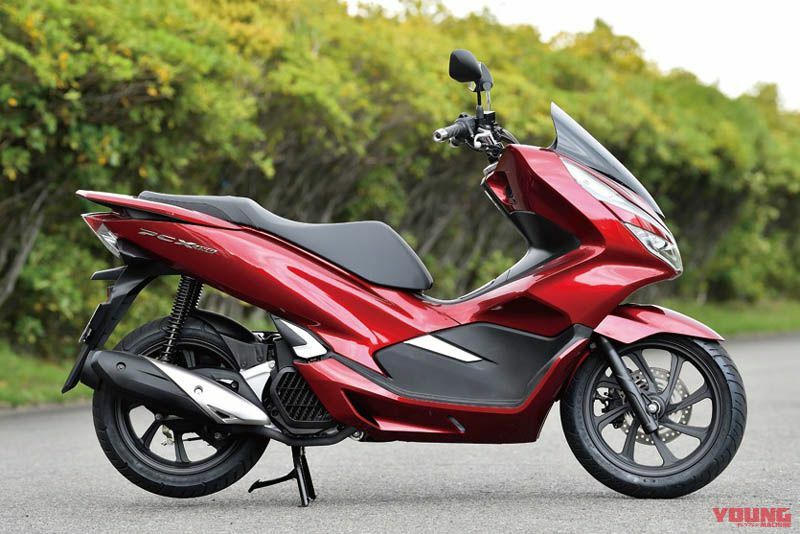 Price: equivalent to $3325 – $3365) The PCX (125) was introduced in 2010, and in 2012 the 150 model was added. Then in 2014 a model change was carried out. The photo here is of a 2017 model, with red front calipers that distinguish it. Before even riding the bike the first thing to notice is how rigid the new model feels. Despite the weight not changing from the previous model, it feels lighter to handle and you can make more use of its power. Once you get riding the bike for real it only continues to build on those good impressions. The impression of the previous generation bike was that the frame and front and rear suspension feels soft and flexible from road surface shocks. In contrast, the frame of the new model has greater stiffness, and the suspension must be doing a good job as it is extraordinarily comfortable to ride. Furthermore, its composure in handling sidewinds on the highways has increased remarkably, and you can cruise comfortably at a speed of over 10kph or more than before. Because the tyres are now wider, you would expect it to feel harder to when tipping into corners and switching from left to right. However, thanks to the apt amount of response and contact patch the feeling of traction has heightened, so any grounds for criticism have been removed. 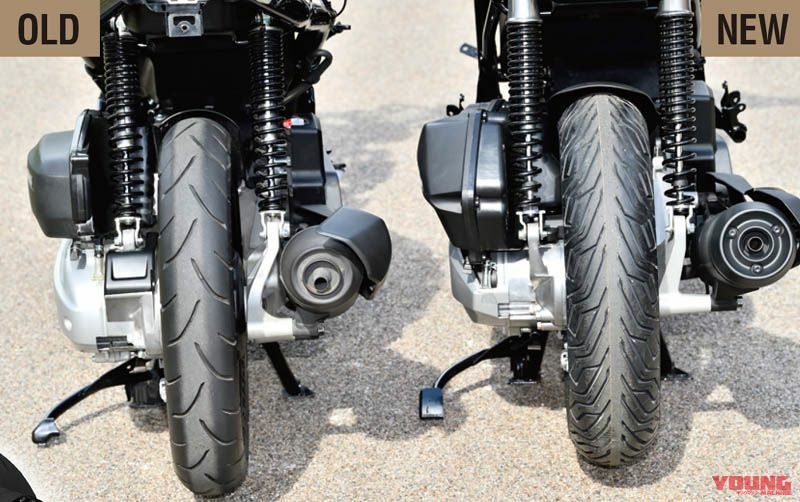 One more thing, you cannot get away from the fact that the looks of the bike have been improved due to the fatter tyres, too. The centrepiece of the new model is the construction of its frame. It has been turned from an ordinary under-bone frame into a double-cradle frame, and that in itself is what raises the rigidity. Also, the front cover stay has been given a resin treatment. Due to these two factors, the weight of the frame has been lessened by 2.4kg. The engine adopts a continuous idling-stop system. It also clears the exhaust emission rules while adding a slight bit of power all throughout – in particular it feels more lively mid-acceleration. The body doesn’t give off much vibration, and it has inherited that quality of which bikers have always sensed in these bikes since the first generation. As was the case with the previous model, there are great expectations in what it can achieve regarding fuel consumption. It appears that the model equipped with one-channel ABS has the advantage of being lighter and more cost effective than dual ABS. We tested out the brakes in a variety of conditions such as loose ground and puddles, and for the most part we got by without feeling any intrusion from the ABS, and were able to reduce speed in a short distance and come to a complete stop. Personally I also like the standard spec bike with the combination brakes, but after feeling the very high level of precision and smooth operation with the ABS, I wouldn’t hesitate in choosing that option. The new engine layout has an L crankcase and a drive & driven sprocket, and the gear ratio has been broadened. The continuous idling-stop eSP mechanism engine kicks out more power in the higher rev range due to alterations made on the intake & exhaust systems. Up until now the tyre size at the front was 90/90-14, and the rear 100/90-14. Now it has been widened to a 100/80-14 at the front, and a 120/70-14 at the rear. Collectively the rigidity of the tyre casing has risen due to the lowering of flatness, and energy loss is reduced due to the widening. It is possible to operate the main switch of the locking system by simply approaching the bike holding the smart-key. Due to a radio wave law regarding place of destination, ordinary keys are used. However, it will be fitted as standard in Japan. “The first generation model released in 2010 was mostly in demand by those in their forties for use as a second bike. However, after the reforms of style in the first full model change in 2014, it became the choice of young first time bike buyers in their twenties. This accounted for a lot of demand from various other countries, so the changes made to this model retain the concept of the first generation, while being and enjoyable bike to ride. Consequently, this all led to the re-examination in improving the frame and engine characteristics. Here are all of the main staff that helped develop the new PCX. Third from the left is person in charge of development, Mr Junpei Omori. He was also involved in work with previous models. Originally a test rider, he is always in pursuit of experiencing the joys of riding.